Learn to Nordic Walk sessions take place every Tuesday with the exceptions of April 2nd and 9th. 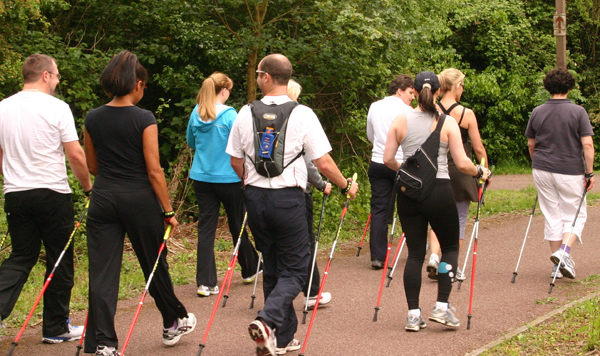 Nordic Walking is a great way to get a fitter in the great outdoors and to meet new people. • Combines exercise with nature and fresh air, boosting mood. There are limited spaces so booking is essential. ChesterPhysioPilates (CPP) is a small business teaching Nordic Walking and Pilates based in Chester and on the Wirral. Instructors are qualified to teach Nordic Walking and Pilates and are Chartered Physiotherapists. The technique is built up week by week through 4 ‘gears’. The sessions are an hour. Toilets are not available on site. The nearest toilets and café are in the Countess of Chester Hospital approximately 5 minutes walk away. On the Countess of Chester Country Park; exact details will be provided on your confirmation email when booking. Not suitable for those unable to walk for an hour. Parking available free on the Countess Country Park site on Valley Drive, CH2 1UL. Charges may apply.